Resume is a very important professional document, which can help you grab great opportunities. 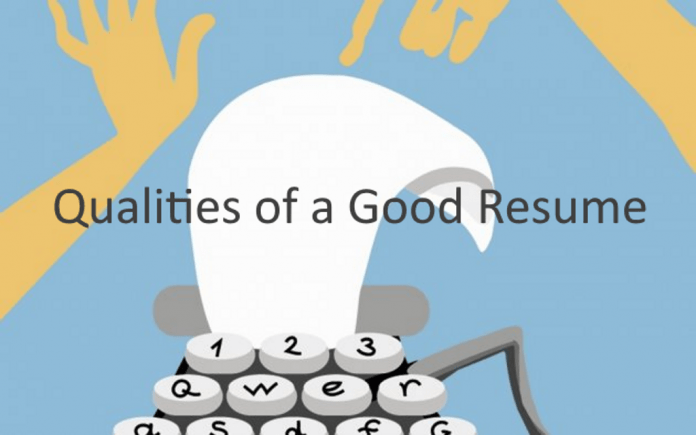 If a resume is well-created, then half of the interviewer’s questions are already answered. Here are a few of the qualities that must be there on your resume before you start applying for jobs. Preparing a resume is not a hard task but preparing a good resume is not a very easy job either. Resume is very important, as it represents you in front of your interviewer or even on the academic and professional front. The following points can help you in preparing the right kind of resume, which can open doors of vast opportunities for you. Resume is all about putting down most of the skill set and experience. Include information such as name, address, phone number, email address, education and qualifications, past working experiences, prospects and so on. Also mention your hobbies, achievements, and interest. This will help your interviewer know more about yourself. Make sure you never miss out on the essential information. Proper detailing makes a huge difference. If you have been unemployed for a while, then don’t forget to mention a valid reason for the same. Specify properly about your education. Be clear about your part-time and full-time jobs, as it will help the interviewer analyze your abilities well. Also, mention your career aims and expectations you have from the firm. While preparing a resume, mention everything that is real. This will increase your credibility and create better chances of working at the interviewing firm. This does not mean that you should be very open about all your flaws. Mention only what is necessary. Do not hide any information which might be risky for you in the future. Resume is a platform where you can show your creativity in the most decent way that will be highly beneficial for you in future. Describe yourself in the most interesting way possible in your resume. Tell them about your hobbies, but at the same time keep them engaged about your personality, skills, and achievements. Keep it interesting to read. Tailor your resume according to the job prospect as well. This will give you an edge over all the candidates. Resume is not supposed to be made just once. It is important that keep updating your resume. Keep adding all the new projects and assignments that you complete and also mention the company’s name and the time duration. Your updated skills and new developments in working will surely make you a potential candidate. These points mentioned above are on the basis of the experiences of a number of candidates, who felt the difference when they redesigned their resumes according to the advice given by professionals. Resume should be on point with crystal clear clarity. When going for an interview, take help of resume writing companies or any other professional in creating your resume for better results. Design and prepare a resume which will help you to grab new opportunities every day.